Before getting into manufacturing weakness, let's talk about consumer credit. Consumer credit expansion in February was below that of January as it was $15.2 billion which missed estimates for $17 billion. January’s expansion was revised higher from $17 billion to $17.7 billion. I’m looking forward to the Q1 quarterly debt report from the NY Fed which will tell us the delinquency rates on this new debt. That report will be released next month. In the consumer credit report, credit card debt increased $3 billion which is still conservative. Keep in mind, consumer confidence in February was hurt by the government shutdown. Non-revolving credit, which is auto loans and student loans, increased $12.2 billion which was down from $15.1 billion. The February factory orders report was weak as monthly growth was -0.5% which slightly beat estimates for a 0.6% decline. However, the previous report was revised down from 0.1% to 0%. 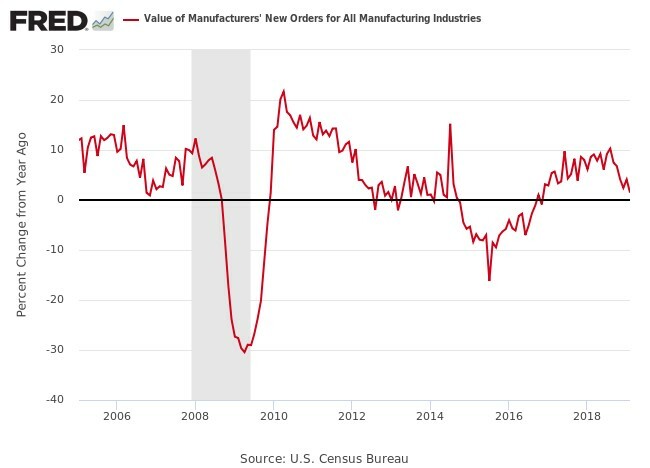 As you can see from the chart below, manufacturing new order growth was 1.5% which was the weakest reading since November 2016. This was the 4th monthly decline in 5 months. I’m not surprised by this weak hard data. Soft manufacturing data has been weak for a few months. I expect yearly growth to fall again in March. The chart gives us some perspective. Even though manufacturing growth isn’t strong like last year, it’s still much better than it was during the 2015-2016 slowdown. This is supposed to be a significant slowdown. If the economy rebounds in the next 6 months, the manufacturing decline likely will be shallower than the last one. Interestingly, this weak factory orders report caused the Atlanta Fed Nowcast for Q1 to jump from 2.1% to 2.3%. That’s much higher than the blue chip consensus which expects about 1.3% growth. It would be remarkable to have 2.3% growth because of the recession fears that were prevalent just a few weeks ago. To be clear, the factory orders report raised estimates for the contribution of inventory investment to 0.15% to 0.24%. Don’t get angry with this forecast; it probably increased because its expectation heading into this report was for an even worse monthly decline. 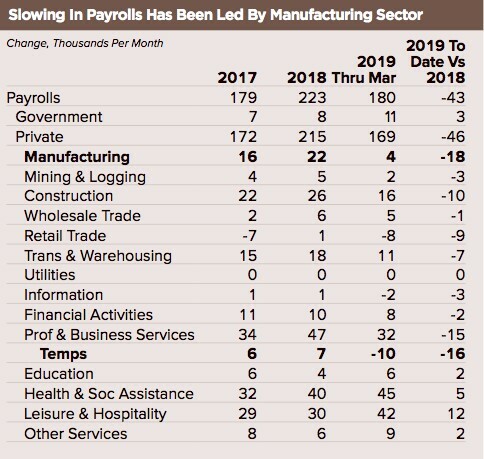 Based on the Markit reports, it’s clear manufacturing growth is slowing, while the service sector is still in solid shape. This is for both America and the rest of the world. 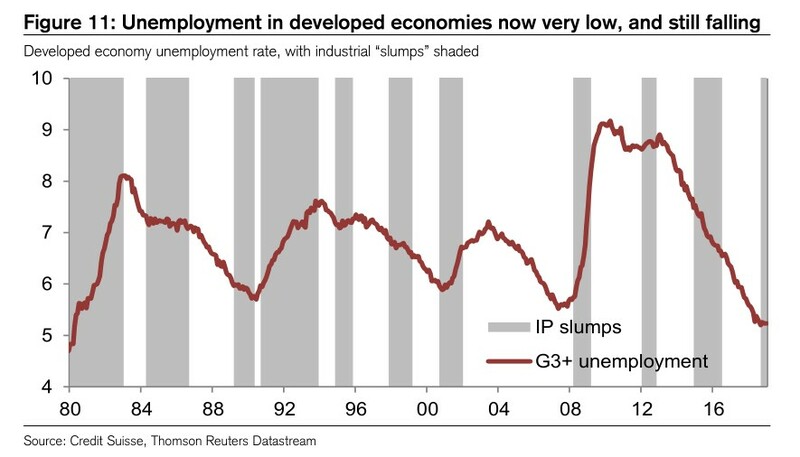 The chart below shows the unemployment rate in developed economies with industrial slowdowns shaded. As you can see, there have been industrial production slumps when the unemployment rate fell, when it was stagnant, and when it rose. There will usually be an industrial production slowdown in a recession, but there won’t always be a recession when industrial production is weak. This supports the possibility that the current industrial production slowdown won’t lead to a spike in unemployment and a recession. Usually when the rate starts to bottom, it increases relatively soon afterwards. That’s where we get back to the prime age labor force participation rate. In America, at least, there is still slack in the labor market left. You can’t have job creation of 196,000 in a labor market that is only seeing job creation because of population growth. Job growth is limited by population growth when there is no slack in the labor market left. China could still be in the early innings of this bull run. Because of its stimulus, which was put in place to counteract the weakness caused by the trade war with America, nominal fixed investment growth, infrastructure spending growth, and industrial production growth have started to improve. This turnaround explains why the Shanghai Composite index is up 31.62% year to date. There’s no question long run Chinese growth is headed lower. However, in the mean time you can make money riding the momentum. As you can see from the chart below, the average Chinese bull market lasts 11 months and provides gains of 113%. This is only using 17 years of data, so be careful. China is clearly a risky market as the average bear market has also been 11 months, with an average decline of 37%. The table on the right shows the probability of a bull market extension after 20% gains. This is all about momentum. In the next 3 months following a 20% gain, the average gain is 8% with 59% of the situations being positive. Return is positive 88% of the time in the following week after such gains. The table below shows the changes in job creation per month in 2017, 2018, and the first 3 months of this year. As you can see, average job creation this year is about the same as 2017, but 43,000 lower than last year. Manufacturing had the worst decline from last year as the 3 month average is 18,000 lower than 2018’s monthly average. On the other hand, healthcare and social assistance have added 45,000 jobs per month which is 5,000 more than last year and 13,000 more than 2017. This industry is in a secular growth trend and has little sensitivity to the economy. That’s great news because it lowers the labor market’s sensitivity to economic slowdowns. That could be one reason why the 3 slowdowns in this expansion haven’t led to recessions. Healthcare and social assistance took the lead from professional and business services which have added 32,000 jobs this year which is 15,000 below 2018 and 2,000 below 2017. Finally, it’s notable that temps lost 10,000 jobs per month this year which is 16,000 below 2018. Manufacturing sector is weakening based on the lagging hard data from February. Labor market shows less jobs were created per month this year in manufacturing, but it’s not something to worry about. I’m more concerned with how the professional and business services industry does in the rest of the year. Chinese stock market has huge momentum. Based on the past 17 years of data, it’s likely that returns will be high in the near term. The trade deal with America could help Chinese growth in the 2nd half of 2019.